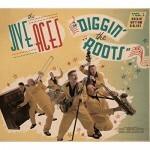 Share the post "Album review: THE JIVE ACES – Diggin’ The Roots Vol.1: Rockin’ Rhythm & Blues"
The hi-energy, jump jive combo The Jive Aces have been around long enough to have been on Opportunity Knocks. But their chosen music predates even that show by several decades, as they raid the golden 40’s and 50’s era for their brand of swing laden, jump jive and rockabilly which makes for a good time party album. Significantly they formed in the late 80’s on the coat tails of the British jump revival, heralded by the likes of The Chevalier Brothers, The Big Town Playboys, Kit Packham Ray Gelato and even Wolfie Witcher etc., and this their 12th album acts like a musical re-appraisal of their influences. They add r&b and put the emphasis on energy and entertainment – if not originality – especially when it comes to covering the usual suspects of Louis Jordan, Louis Prima and Big Joe Turner etc., and their more obvious songs. That said, they do open the album with their very own ‘Rock & Roll Movie Star’, a stop-time jump jive and rockabilly track with a narrative that references beautiful girls, hot-rod cars and guitars, all topped by John Fordham’s sizzling sax. They do a reasonable job of covering Big Joe Turner’s ‘Feelin’ Happy’, while guest vocalist Cassidy Janson, makes two appearances on the wailing sax and bustling piano of Ruth Brown’s ‘Mama, He Treats Your Daughter Mean’ and the more impressive cover of Louis Jordan’s ‘I Want You To be My Baby’, on which her scatter gun vocal delivery and the band’s call and response section is a highlight. But having turned up the heat, you anticipate the band will tear things on up Jordan’s ‘Choo Choo Ch’Boogie’, but in truth Ian Clarkson vocals are slightly too retained and only another rip-roaring sax break rescues it from being dutiful rather than inspired.. The same applies to ‘Rock ‘N’ Roll Boogie’. Perhaps by the end of the album the band are a victim of their own relentless drive which doesn’t quite deliver the explosive finale you might have imagined. No matter, there’s still plenty to enjoy, especially the honking sax led version of Red Prysock’s ‘No.13 (Fruit Boots)’, on which sax player John Fordham and pianist Vince Hurley star. This entry was posted in ALBUM REVIEWS, ALBUM REVIEWS (Mobile), All Posts and tagged album, Big Joe Turner The Big Town Playboys, blues, Cassidy Janson, Diggin' The Roots Vol.1: Rockin' Rhythm & Blues, Ian Clarkson, jive, John Fordham, Jump, Kit Packham Ray Gelato, Louis Jordan, Louis Prima, Red Prysock’, review, rockabilly, Ruth Brown, swing, The Chevalier Brothers, The Jive Aces, Vince Hurley, Wolfie Witcher. Bookmark the permalink.